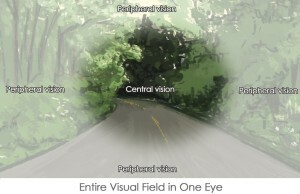 Home »Commentary»Sightings in Peripheral Vision; Credible or Not? Sightings in Peripheral Vision; Credible or Not? How many times have we heard stories that begin with "Then out of the corner of my eye I saw"? Or, "I saw movement out of the corner of my eye"? Are these "Sightings" credible? To answer this question, we must first examine what peripheral vision really is. Unlike some insects with multiple eyes, humans only have two…both of which are uni directional. Yes, we can move our eyes around to focus on something, but the eye itself is designed to fix on objects directly and send visual images to the brain for interpretation and identification. Anything outside the direct line of sight is blurred and distorted as compared to the direct vision our eyes are designed for. When we look at an object, our eyes send that visual picture to the brain, which then compares it to millions of stored items from our memories that have already been identified. Ever look at something you've never seen before and it takes you longer to recognize that object? This is because the brain is desperately trying to compare it to known memories and find an object it looks most like. When we see something in our peripheral, our eyes are not focused on that object, and the brain has very limited data to go on when identifying it. Many times, the brain simply attaches the most readily identifiable object that best fits the general shape of the object. One of the most identifiable objects to the human mind …is the Human Form. If you've ever sworn that you saw a person "out of the corner of your eye" and turned to discover it was just a door or other solid object, then you know where I'm going with this. Many times we hear stories of "Sightings" that were originated in a witnesses' peripheral vision. "I saw something move out of the corner of my eye, but when I turned to look…it was gone". Some people immediately accept this as a paranormal experience when all it really was, was the person's mind attaching the human form to something it could not identify because it did not have enough data to go on. Even a differently colored object in a dark room can create the illusion of movement…especially when we are walking, or scanning the room with our direct vision. If you stare directly at the object, you understand that a light colored door stands out slightly even in the dark, so it stands to reason that when our eyes are moving, that object could be interpreted by the mind as movement simply because it is different than the rest of the area being scanned. And since our brain doesn't KNOW it is a door..it attaches an identity to it that most closely resembles it…usually the human form. It is also important to note that, "Dark" comes in many different shades and hues. In a dark room, there will be areas that are darker, and areas that are slightly lighter. These variations are not immediately interpreted by our mind, since our eyes are telling it that the room is simply "Dark". When you go to bed at night, try this….close your eyes for about five minutes…then open them and scan the room. Look closely, you will be able to see certain objects that you couldn't see when you first turned off the lights. Objects that are lighter in color will be easier to see, while objects that are darker may remain hidden or unidentifiable. Also notice that there are certain areas of the room that appear darker, some slightly lighter. Still some areas appear to move or change shape. This is because your eyes are adjusting to the dark, and still cannot penetrate some portions of the darkened room. Keep this in mind every time you investigate with the lights off. But I digress, and have ventured into an area I want to cover at a later time. Hope this wasn't too long, and that you are able to glean some insight into witness, as well as personal experiences dealing with peripheral sightings.